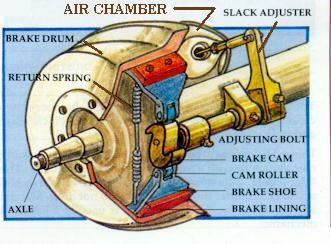 Brake Adjustment is attained by adjustment of the Slack Ajuster by means of turning the adjusting bolt. The brakes are first tightened by rotating the screw in a direction which moves the tip of the slack adjuster – and the pushrod – TOWARDS the air chamber until it stops – at this position, the brake shoes are tightly up against the insides of the brake drums. Note that in normal brake adjustments, the movement towards the air chamber will be barely noticeable – but if you turn it the wrong way, you will come to a point at which the pushrod definitely moves away from the chamber. Then, the screw is rotated a quarter-turn in the opposite direction, giving just enough slack to the system to eliminate brake drag, which can overheat the drum and bring about excess wear and premature fade when they’re used. 2. Set the mechanical driveshaft brake, and/or block at least one wheel front and rear with sandbags or chocks. 3. Release the spring/parking/”Maxi” brake, – to the “drive” position – if fitted. 4. Set the slack adjusters one at a time. Beginning with the first one, rotate the worm adjuster bolt in the direction which moves the end of the slack adjuster TOWARD the air chamber. Run the bolt down until it stops. (Note: if the brakes have been working, this should not be very many turns!) At this point, if the shoes are visible, they should be tight against the drums. 5. Turn the adjuster bolt back 1/8 – 1/4 turn. With a “Brake Buddy (TM)” or suitable wrench, attempt to move the slack adjuster away from the air chamber. It should move about 1/4-3/8″, indicating that the shoes are not close enough to drag on the drum, yet close enough that there is a safety margin of air chamber movement for brake applications. Some models of slack adjuster require that an outer “locking sleeve” must be pushed down out of the way in order to gain access to the adjuster bolt. If this is the case, ensure after adjustment that the sleeve pops back into place. 6. Proceed with the other three wheels. Note that, in the case of spring/parking brakes, the dashboard control must be in the “Brake Off,” or “Drive” position before brake adjustment is possible – this will adjust both the service and parking brake. DO NOT release spring parking brake (“maxi”) unless and until you have chocked a couple of wheels! 7. Your brakes are now adjusted. Set the spring/park/”maxi” brake before removing the wheel chocks. 8. Release the mechanical drive shaft brake, if any, put the vehicle in gear, and try to move off against the maxi brake. This is a quick check to ensure you haven’t set the rear brakes backwards. (See below.) As you move off, tap the brakes to ensure that they’re working – much better to find out you’ve screwed up when you’re in the speed range coverable by the parking brake! There is a major possible pitfall to adjusting airbrakes. This is the fact that they can be inadvertently set BACKWARDS! It is possible to run the slack adjusters to the full loose position, then run them back a half-turn towards tightness, which of course means not a loose brake, certainly not a tight brake, but in fact NO brake. The best situation in this case can be that they are ALL set backwards, since if one, two, or three are set properly, the lack of braking power by three, two, or one will not be felt until the brakes are really needed, such as a long descent, in which case the overtaxed brakes which were set properly may soon fade to uselessness. If, on the other hand, ALL the brakes are improperly set, you’ll soon know when you do the “moving-off” check in step 8 above. A slack brake will also eat more air on each application, and the increased demand can bring the pressure down more quickly than the compressor can keep it up. Bear in mind at all times that the brake is tightened when the end of the slack adjuster moves TOWARD the air chamber, and loosened when it moves away. Thus when doing the first step of adjustment, watch the end of the slack adjuster, and ensure that it moves TOWARD the air chamber. This may be towards the front or the rear of the vehicle, and it may be clockwise or counter-clockwise rotation of the adjuster bolt. What is important is that the pushrod bottoms against the BACK of the air chamber. – Then it is loosened 1/8 – 1/4 turn so the brakes won’t drag and overheat when not being applied. 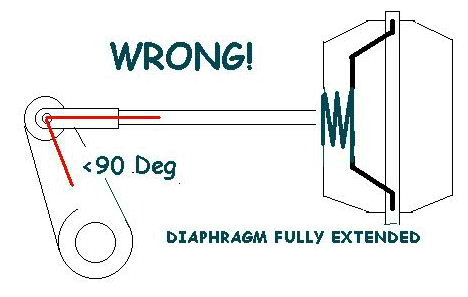 Note the angle of the pushrod relative to centerline of slack adjuster is MORE than 90 degrees. LOOSE Brake – Angle is LESS than 90 degrees; Slack Adjuster has PULLED the diaphragm to the fully extended position, there is no braking left! 1/2 turn of tight will do NO Good! If the angle is LESS than 90 degrees, then the brake is certainly at its loosest – the slack adjuster has PULLED the diaphragm to its fully extended position, rather than PUSHING it to the fully retracted one. 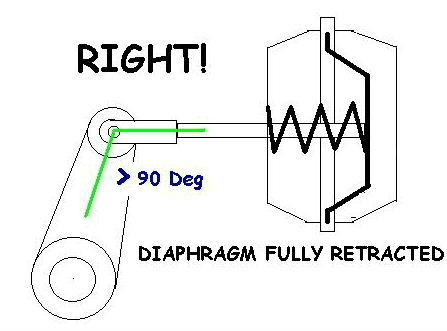 Application of air to the chamber will result in NO further pushrod/brake movement. Many lives have been lost due to inexperienced operators running the brake fully slack, an then “back” towards tight a 1/8 – 1/4 turn! If this is done on one or two wheels only, there may still be enough brakes on the wheels set properly – until they fade – to fool the driver into thinking he has brakes! In both these cases of “adjustment,” the apparent possible movement of the slack adjuster will be the same – about 1/4-3/8″. Meaning that the operator can be fooled into thinking that, since there is only this small amount of movement, the brake can’t be too slack. But in the latter case, he’s checking the distance from just short of fully extended to fully extended, not the distance from fully retracted to the point of brake shoe contact in the drum. It is VERY important to know the difference! It must also always be borne in mind that there are other things to monitor besides brake slack. You also must monitor the “air budget” – at the first sign that the brakes are using more air than they should, check for leaks by stopping, shutting off the engine, and listening about the vehicle, with brakes off and applied (assistant necessary), and check also the compressor belt for looseness or signs of slippage (shininess, excessive hotness, etc.) Always have a spare belt on hand for roadside replacement in cases of slippage due to excess wear, or wear in case of excess slippage. Tension according to manufacturer’s instructions – usually about 1/2-3/4″ of slack at center of longest run. Brakes Can Be Too Tight! After driving for 10 – 15 minutes after a brake adjustment, it’s a good idea to pull over, set the parking brake, and do a walk-around, feeling the brake drums on each wheel. A too-tight brake will have heated up by this time, and this can result in brake fade. Of course, this applies to situations in which you haven’t been using the brakes much, or at all, in that time. Do not forget your mechanical driveshaft brake, if you have one. These too can get out of adjustment, so this should be checked on a regular basis. If the hand control lever is approaching its limit of travel before the brake activates, be sure to get in there and check its slack adjustment as well.